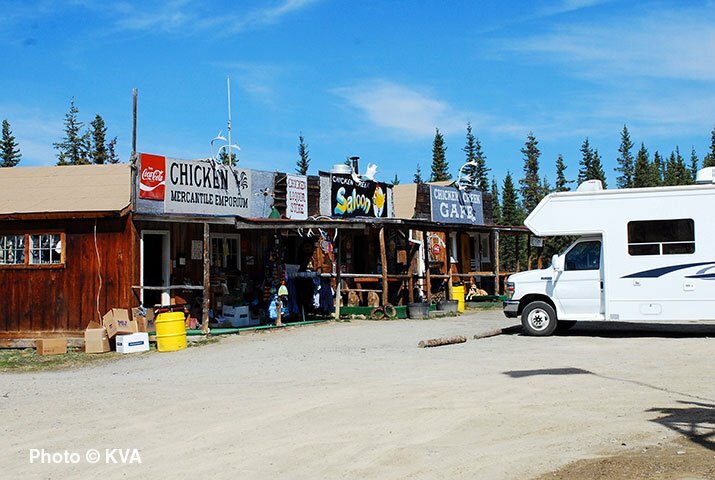 Chicken, Alaska is a small community that sits along the Taylor Highway, which can be accessed from the Alaska Highway or the Top of the World Highway. In its heyday, Chicken was home to about 400 people. Today, the population during the summer sits at around 50; in the winter, only six people stay in town. Chicken is Alaska’s last remaining gold rush town. Gold was discovered in Chicken in 1886, ten years before the Klondike Gold Rush began. Enough gold was turned up in the area over the following years to warrant the expensive task of bringing dredges to the area, which extracted gold and turned up the earth until the 1960s. Today, you can visit the Pedro Dredge at the Chicken Gold Camp & Outpost. It was relocated to this spot after 31 years of sitting idle, and tours of the dredge are offered daily throughout the summer season. A short hike from the Taylor Highway will take you to a viewpoint where you can see the Cowden Dredge sitting abandoned on the Mosquito Fork. Chicken’s name comes from the early gold miners. As a townsite grew during the gold rush, the need for a post office meant that residents had to decide on a name for the town. Many wanted to call the town “ptarmigan,” after the large population of this species of bird that live in the area, but no one could agree on the spelling. Hence, the town of Chicken got its name!